Back in December 2010 I wrote a blog titled “Numbers Don’t Lie.” At the time I tracked my nutritional intake and training output on an excel spreadsheet. I was a year into training for my first marathon that would take place just three weeks later at Walt Disney World. Now days there are a plethora of different websites and technology to help people keep track of their caloric intake as well as their physical activities. Today, I’ve left Microsoft Excel spreadsheets behind in lieu of my Fitbit. I own a Fitbit One and enjoy logging all of my calories and physical activities throughout the day. I can keep an eye on my calories in versus calories out throughout the day and at any given time have a snapshot of where I am in my daily fitness journey. It’s a very helpful tool and it keeps me honest. Why? Because numbers don’t lie. If I choose to not log a snack I am just cheating myself and skewing my numbers. If I want to know why I’m gaining, maintaining or losing weight then it’s easy just to look at the numbers and know whether or not I need to make an adjustment or stay the course. Looking at the numbers takes a lot of the variance out of the thought process. I have had people swear to me that they barely eat anything and cannot lose weight. It’s becoming more common knowledge that if you use more calories than you eat then you will lose weight. What many people fail to consider is the damage of one or two meals each week. In the past I have enjoyed a “cheat meal” as a reward. 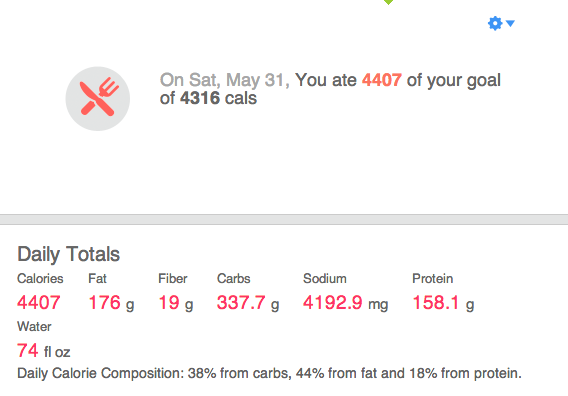 What I didn’t realize is that I could offset all of my efforts with that one meal if I weren’t careful. Having a cheat meal is okay, but I still needed to pay attention to serving size. If my cheat meal accounts for 2-3 thousand calories or more then I very well could have worked out the entire week just to have that one meal and NOT lose any weight. Of course this is assuming weight loss is the goal. This includes even running a marathon. Imagine going to a cookout and indulging after a hard fought 26.2 mile run (marathon distance). You have some major hunger so you have a burger with chips, potato salad, a coke and maybe even throw back a couple beers. Later on you decide a hotdog looks good…after all you EARNED it across those 26.2 miles, right? You also have dessert and maybe another beer if you are so inclined. A couple cookies make their way to your plate as you hash the day’s running event with your friends and family reciting paces per mile and the number of gels you took in along the way. Before you know it the afternoon is gone and you stick around for Round 2 of eats and treats! After all is said and done you begin to add up the caloric intake and come to realize that while you may have burned ~4,000 calories during the marathon that you ingested in excess of 4,000 calories for the day. Even after a marathon effort you can still take in more calories than you burned for the day! Now, you know me and if you’ve read my other blog posts I adamantly defend the right to enjoy a good cookout! Plan it into your training schedule, please! However, we still need to take into consideration portion size. Have a beer…heck have two or three! Have a burger! Have a slice of pie! But, keep track along the way as you don’t want to negate all of your efforts. I want you to understand that while running is a great calorie burning exercise running is NOT an open ticket to eat anything you want as much as you want. Also, don’t go in the entire opposite direction. After a marathon (or any a long run) you need to take in calories for recovery and taking in extra protein afterwards is a good practice in my experience. Again, focus on proper portion size…not too much and not too little.